There is no shortage of soft squishy pillows with small useful speakers to plug into your iPod. However, few have a design this perfect. Instead of pretending to be just an ordinary cushion they paid tribute to poor old technology that has long since become pretty useless to the general public. Although at first glance it’ll still appear to be nothing more than a silly novelty cushion, until it’s put to use. 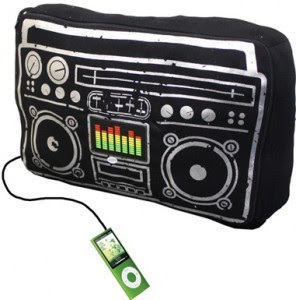 The boombox speaker cushion has all the normal functions that a set of portable speakers tend to have. It has the standard 3.5mm jack to make sure you can plug in your iPod. To give it some power you’ll just need to charge it up through your USB port, which means you won’t have to keep a stash of batteries. Unfortunately there isn’t much word on pricing and to make it worse I haven’t found much through my various Google searches about this one. More information may turn up at some point though.